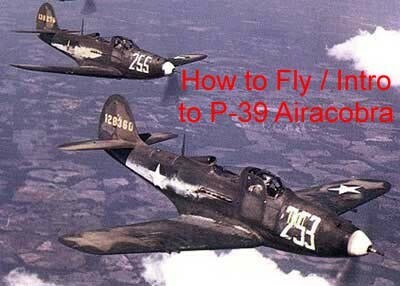 How to Fly/Intro to P-39 Airacobra video contains three World War II era films and the P-39 Airacobra pilot's manual on the DVD. The first two films are Introduction to the P-39 and How to Fly the P-39, both made by the US military during World War II. One of the Russian Air Force's favorite US imports, the Airacobra was an outstanding tank buster on the Eastern Front. Its mid engine and 37mm cannon were virtually unique. The '39 was widely used as a trainer in the US and had a reputation for weeding out poor pilots -- permanently. Two very thorough and informative fighter pilot training films covering all aspects of Airacobra operation. In B+W with a run times of about 38 and 24 minutes. Film #3 is Collecting And Reporting Enemy Information by Fighter Pilots. This rare early war training film features P-39s from the 181st Squadron carrying out a complete mission, with an emphasis on briefing sessions, gathering intelligence during a combat mission, and how to give accurate after action reports. Basic squadron tactics are also covered . In B+W with a run time of about 17 minutes. A 36-page P-39 Airacobra pilot's manual is included on the DVD. It is in .pdf file format with photos, detailed systems diagrams, performance charts, flight procedures & more. The manual can be accessed on a computer equipped with a DVD drive.